A giltbronze image of the Udhyana Buddha, standing dressed in all-enveloping, elaborately pleated robes. The Buddha raises his right hand in abhaya mudra, the hand position indicating ‘fear not’. The left hand points downwards in varada mudra, signifying ‘your wish is granted’. The head is crowned by an elaborate hair arrangement, with pleated strands and a high chignon, at the front of which are two circular ornaments. The facial features are sharply defined and the ears have long earlobes. The gilding is bright and well-preserved. The Buddha is contained within a Japanese wooden box. The Udhayana Buddha (zhantanfo in Chinese, literally meaning ‘sandalwood Buddha’) is based on the image of a large sandalwood figure originally commissioned by the King Udhayana of Vatsa in India, who was the first to have an image made of the Buddha whilst he was still alive. This classical image was much copied in countries where Buddhism was prevalent, including China, Japan and Korea. A sandalwood copy of the Buddha was brought to China as early as 405 AD. 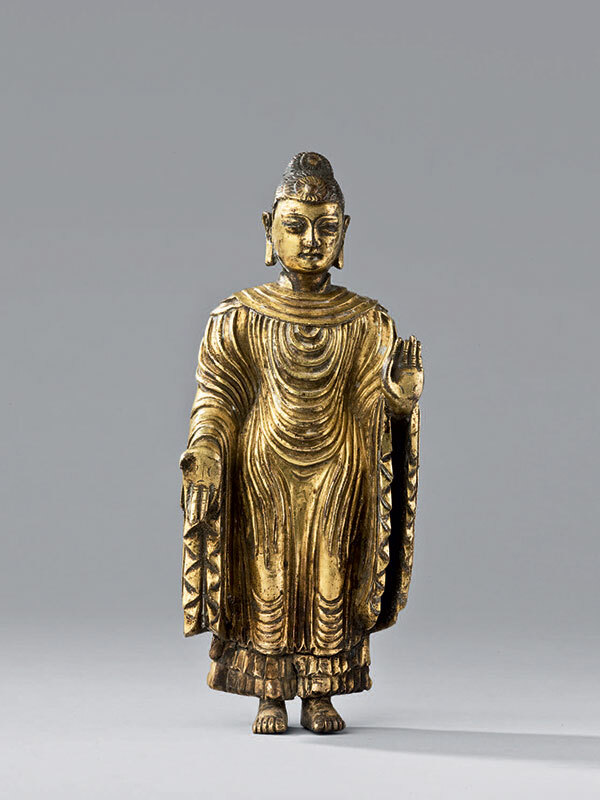 As this sandalwood Buddha was extremely popular, copies of the statue were made throughout the dynasties. Two early giltbronze Buddha figures are possibly based on this sandalwood Buddha, which is evident from the very deep carving on the folds of the robe: a 5th-century Northern Wei dynasty (386 – 534) very large image of the Buddha is in the collection of the Metropolitan Museum of Art in New York; a Yuan dynasty Buddha of smaller size is in the Minneapolis Institute of Arts. Compared to the present figure, apart from the closely comparable image preserved on the Ming dynasty ink rubbing dated to the 1597, a Ming dynasty giltbronze Buddha in the collection of the Detroit Institute of Arts Museum, although much larger in size, would be the closest example. It is closely comparable in appearance, hairstyle and with an extra rounded collar turned out from the robe. This giltbronze Buddha was once dated to the Ming dynasty (15th – 16th century), but it has been suggested by scholars to possibly have a later date (the early Qing dynasty), due to the feature of the rounded collar, which inspired and is commonly presented in the Qing dynasty Udhayana Buddha.